For many people, the arrival of summer in the United Kingdom, or at least what passes for a summer in the United Kingdom, is synonymous with the festival season. Music festivals are at the forefront of the thoughts of people at this time of year but a festival can be any event that brings people together for a common cause of celebration. It may be a stretch of the imagination to turn your wedding day into a festival that celebrates your love but for many people, their wedding event may feel like the sort of event that matches the peak of the parties taking place across the UK. Of course, many couples met at music festivals or enjoyed great memories at these sorts of events so for a summer wedding, it is easy to see why a couple would like to draw on the themes and styles of a festival for their big event. If you want to capture the essence of summer, fun and frolics for your special day, this festival flowers wedding stationery from Wedding in a Teacup is the ideal choice to inform people of all the details for your fantastic occasion. 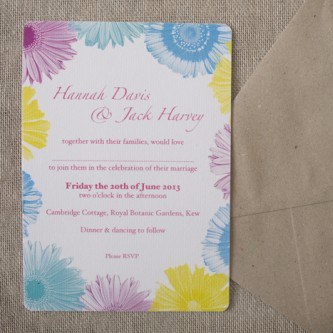 There is an upbeat and lively feel to this invitation, with bright flowers around the edge of the invitation providing an eye-catching focus to the information contained in the centre. If you want to provide people with an invitation that can be displayed with a touch of flair and panache, this is definitely the sort of card that would like great on a mantelpiece or table. With the ability to fully personalise all information and a range of associated stationery on offer, this is the ideal way to announce the biggest event of the summer season.